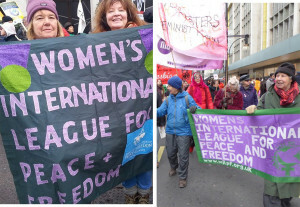 WILPF Cornwall Branch Organises Peace-related Events locally throughout the year. We usually meet on the fourth Saturday monthly, at the Hypatia Trust, Penzance 2.30 pm till 4.30 pm. WILPF Cornwall will be joining other Peace Groups in Truro and Penzance for International Peace Day. at Hypatia Trust, Lower ground floor, The Regent, 54 Chapel Street, Penzance, Cornwall, TR18 4AE. WILPF Cornwall will be making banners at Redwing in preparation for Anti Arms Fair/Anti Nuclear Weapons demo on 2 September, 11am, Lloyds Bank Penzance. A Peace Festival/Picnic will take place in Penlee Park, Penzance. All members are encouraged to attend. Branch members are supporting the organiser, Pete (CND). We invite you to the screening of the Trails Of Spring-Poster. A powerful film by Gini Reticker, set in Egypt during the uprisings. The film shows the courage and persistent determination of women in their quest for Women’s Rights amidst a background of molestation, abuse and torture Contact Amnesty amnesty.penzance@gmail.com ~ 07974 000747 Contact WILPF brigittemorrigan@talktalk.net ~ 07502 465460 Following the film there will be a question and answer session with the participation of three women peace/human rights activists from the region. We are a very ‘young’ group, formed in 2014 and gained Branch status at the Annual General Meeting on 14 March 2015. We were quite active through 2014: organising two vigils, 15th May for the International Conscientious Objector’s Day and 4th August for the Commemoration of the Women’s Rally at Kingsway Hall London 1914. We also attended the 101st Anniversary of the Suffragist Walk from Lands End. Although far from Scotland, we currently support the protests and blockades of the Faslane nuclear weapons base.